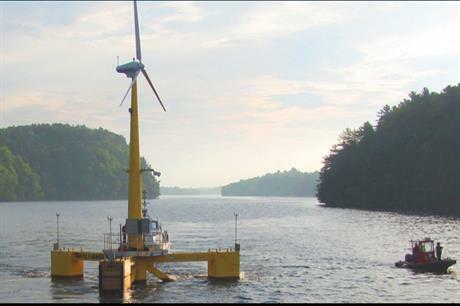 UNITED STATES: The University of Maine (UMaine) has been awarded $3.8 million by the government's Department of Energy (DoE) to continue developing the VoluturnUS floating turbine platform. The cooperative research agreement will allow UMaine to design and develop a full-scale version of its 6MW floating platform. The announcement was made as the university celebrated the one-year anniversary of its one-eighth scale prototype of the platform being deployed off the Castine peninsula, Maine, northeast USA. The 20-metre prototype was the first offshore turbine to produce electricity for the US grid. It uses a concrete semi-submersible floating hull and a composite materials tower designed to keep costs low. In May, UMaine missed out on a $47 million grant from the DoE to help bring its 12MW Aqua Ventus project online. The VolturnUS platform would be used at the project, which is being developed by the UMaine led consortium, DeepCWind. UMaine receivde a $4 million grant from DoE in 2012 to help with the floating offshore project.